If a real-world con game has to be meticulously constructed in order to work, a movie about con games — like Focus — has to be even more meticulously constructed. 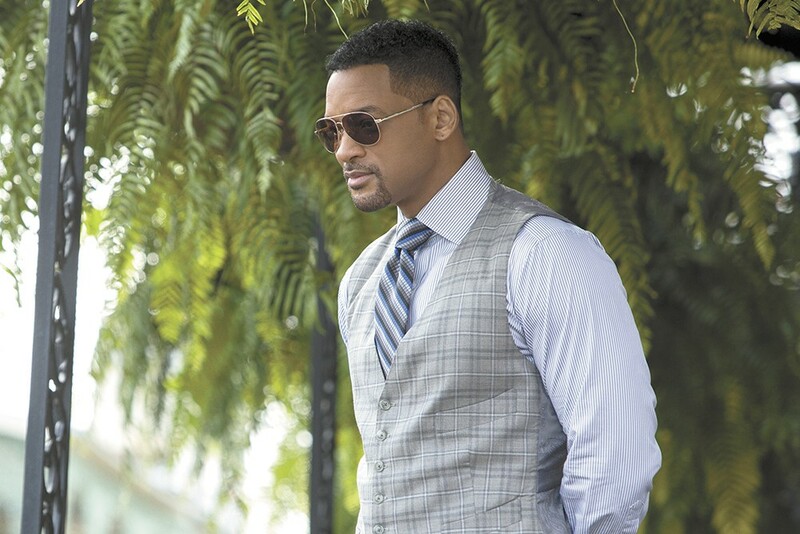 As Focus's professional con-man "hero" Nicky Spurgeon (Will Smith) informs his new would-be protégé, Jess (Margot Robbie), a successful con is all about diverting the attention of the "mark," and this is true of a movie con and its audience as well. But the difference is that a movie audience knows a con is coming. It's more like a magic show: We're looking for the trick the whole time. Complicating matters even further is that the filmmakers are ultimately going to explain the trick to you, in a way that makes you feel like you should have seen it coming. A con artist will do everything he can to keep you from figuring out how you just got fleeced; a con-artist movie had better put the puzzle together at the end, and in such a way that you never feel like that last piece was being hidden from you. It was merely turned upside down, over on the corner of the table, the whole time. In short, Focus is the kind of movie that should almost never work. Like many such movies, Focus tries to raise the stakes by making them emotional as well as financial. Con-game movies demand a protégé as an audience stand-in so we understand the rules of the game, and thus the relationship between Nicky and Jess begins as a purely professional one, as Nicky indoctrinates her into his team of expert swindlers, pickpockets and frauds for a big cash-in in New Orleans during the week of the [Professional Football Championship That Would Be Identified as the Super Bowl Only If the NFL Chose to Endorse an Image of Super Bowl Week As a Buffet for Crooks Looking to Rip Off Attendees, So Instead Is Called Something Else]. It's during this segment that Focus is at its most purely entertaining, with directors John Requa and Glenn Ficarra (Crazy, Stupid, Love) capturing a meticulously choreographed operation lifting wallets, watches and jewelry from unsuspecting fans on the crowded streets of the Big Easy, plus one high-stakes encounter, nominally plausible yet satisfying, between Nicky and a gambler (BD Wong) at the Big Game. But eventually things start to get personal, as Nicky and Jess fall into a romantic relationship together — and it's here that Focus is in risky territory. In part, it's because the very nature of the premise has us forever second-guessing whether the relationship is authentic, or whether one of them is setting up the other for a takedown, or maybe both are. Yet there's also the simple matter of chemistry, and it's here that Smith bumps up against the limits of his appeal as a screen performer. While his strength has always been his charisma, here he's trying to play a character whose entire livelihood is predicated on not being noticed, and swallowing his biggest emotions so he can maintain a single-minded attention to getting the job done. Robbie is a magnetic performer, with just enough elusiveness here that her true motivations remain unknown, and she never quite clicks with Smith when it feels like he has shut off his personality entirely. Focus rediscovers a bit of momentum in the last third, as the setting shifts to a job Nicky takes in Buenos Aires working for an ambitious racing car team owner (Rodrigo Santoro), with a great role for Gerald McRaney as a gruff enforcer. And the final "big reveal" should be a real winner: It plays nicely with expectations in a variety of interesting ways, makes use of a couple of set-ups from earlier in the film, and generally does the impossible-seeming thing of feeling both surprising and inevitable. Focus and Focus: The IMAX Experience are not showing in any theaters in the area.